For a tool that’s millions of years old, you’d think that all the innovations and idiosyncrasies have been explored by now. But our latest Badass Knife of the Week proves that the brightest minds are still coming up with new ideas and inventions that have never been done. 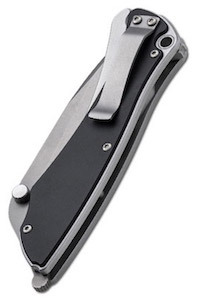 The Boker Plus Griploc is an elegant folder that offers a unique and creative way to engage and disengage the blade. The 3.5-inch blade opens up quickly and smoothly with a flipper near the top of the handle like many other pocket knives. But when you hold the knife in your hand, its unique handle design uses the pressure to keep the blade securely open. When no pressure is applied to the handle, the AUS-8 blade closes easily. It might take a little getting used to at first, but once you get the hang of it, you’ll wonder how you ever lived without it. The Griploc is a collaboration between Boker Plus and Grant & Gavin Hawk, a father and son knifemaking duo that’s been hailed by Chris Reeve as the most innovative design team in the industry. Although this unique mechanism was seen on the Hawks’ custom Beetle knife, the Griploc makes it widely available at a reasonable price. If you’re still tentative about the lock or anticipate doing more rigorous tasks, a safety slider hidden in the handsome aluminum handle keeps the blade permanently secured. The Griploc is also available in a black iteration. For more information on this Badass Knife of the Week, check out the product page for the Boker Plus Griploc.